I love this room and would be very happy to spend time in it. My cousin feels the same way, which is why she bought me this card many years ago and why I kept it after it arrived in the mail. Recently I came across it again and realized it contains all the colours I had begun to commit to for the house renovation - the dark brown of the dining set we bought, the blue of our sofa, the mushroomy grey of our small-enough armchairs, and even the gold of the higher-end light fixtures I scored on sale (yay!!!) So now I carry it around with the colour swatches and samples as my inspiration picture, to keep me on track. From another perspective though - there is everything wrong with this picture. Where's the knitting, or the spinning, or the loom? There isn't even a lump of embroidery cast down in a hurry because a companion brought in a sumptuous fresh-fruit snack. 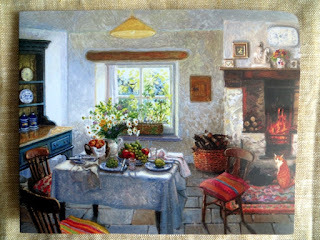 The picture is a detail from Farmhouse Kitchen by Stephen Darbishire, RBA, and if you Google those descriptors you get the most AMAZING collection of dream rooms. I would love to own an original of any one of these paintings, or even a print - must look into that. Getting from framed walls to a finished, inviting room is a challenge, not least when all your original furniture is the wrong size and you have to buy new (or new-to-you.) We used our decorating budget to upgrade our heating and ventilation system. We're using our condo renovation budget to take care of the rest of our new furniture, all our tiles and counters, and expensive but necessary blinds. 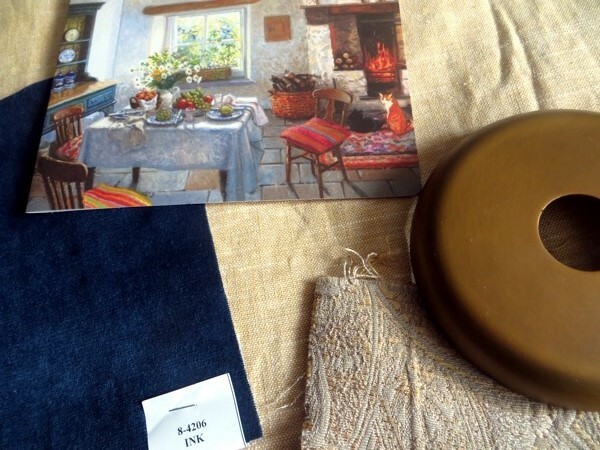 There's a little left for lighting and curtains, but I've had to do some serious bargain hunting and be very flexible about colour and finishes to get close to the same quality we chose for all the other details. I want everything to work together after all the effort I've put in and so far, things are working out okay. Today for example I got a fantastic discount on yellow-gold linen/cotton drapery panels. I knew I wanted that particular curtain, though I was aiming for off-white. 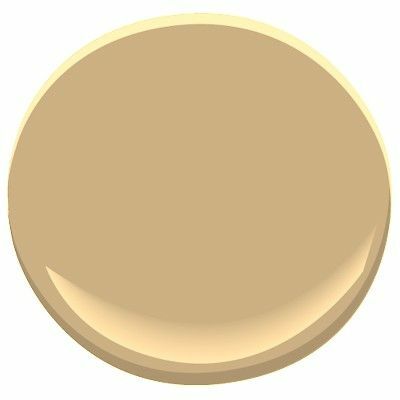 I changed my mind when I saw that this other colour was being discontinued and was priced to sell, and I bought a TON of it for every room that didn't absolutely have to be off-white. Dining room, adjoining front hall, smaller bedroom, my office... done. 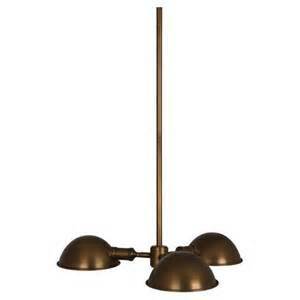 They're all getting yellow-gold curtains similar to the light fixture in Mr. Darbishire's farmhouse kitchen. 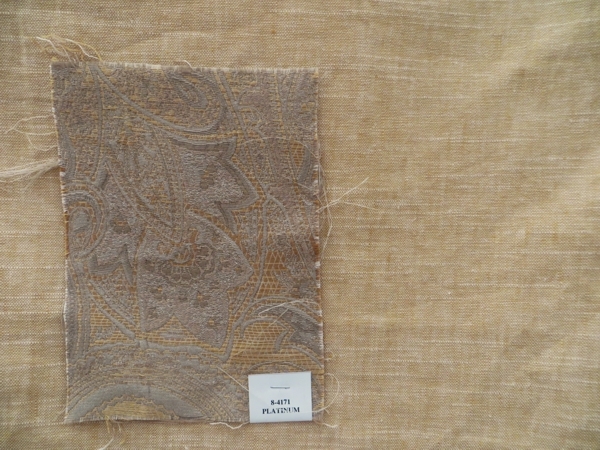 Does the brocade look any more perfect for the curtain in this light? Not really... but trust me, it's dead on. Even though that colour looks painfully beige on my screen, it's a gorgeous deep gold in person. Paint costs the same no matter what the colour, so why not pick one that goes with the curtains for a nice seamless wall? I am seriously going to need to bring more blue into the dining room if I want to match the Farmhouse print, but I have a painting to help with that, and our dressy-uppy dishes too. Okay, I think all that news sums up what's really wrong with this picture. There's no knitting in it, and there's no knitting in here, either! I've been too busy all day shopping and double checking that everything still works together to sit down with a sock. So that's what I'm going to do now, and with luck, I'll be back here on Monday with something stitchy to show you. Have a wonderful relaxing weekend, and I'll see you then!